Kendall is a very talented photographer, but he doesn't shoot much. from the inside out. He also works all the time (at a camera shop) and doesn't have much time for photo shoots. However, when he does get the time....he goes all out. I'm so proud of this man. 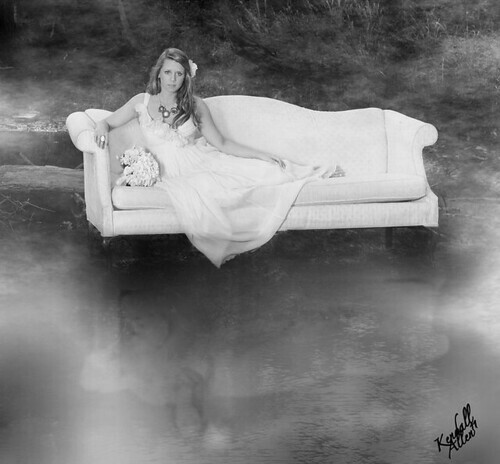 Kendall's dream was to shoot his wife's bridal portraits. 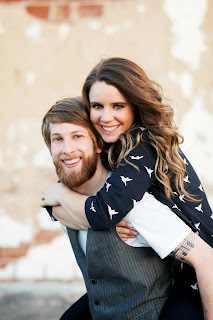 I fought him on this for months because I didn't want him to see me until the wedding day. Well, I gave in and he got his way. 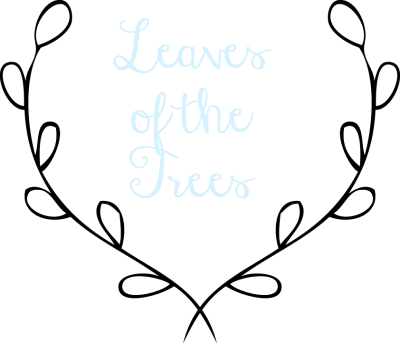 In the end, I wouldn't change it for anything. He did such a great job and it was so much fun. He put in so much hard work and I really felt how much he loved me as he photographed me through his view finder. All of this shoot was his idea. I bought the ivory vintage for $40 at a resale shop and he wanted to do an environmental shot in a swamp. We trekked out into a swamp with couch and photography equipment in hand. Don't worry, we had a lot of help to pull this off without getting dirty. 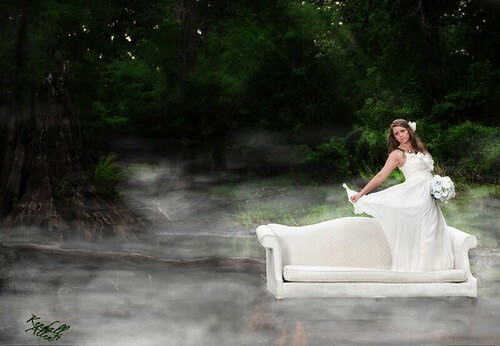 We set the couch up in the middle of a swamp and my mom put my dress on me while I sat on the couch. Kendall went to work and did his thing. I was very impressed with the results and the time he put into these. We will probably take more pictures for our one year...maybe a trash the dress shoot? Seriously though, these are stunning. Wow! These are gorgeous! I love the old couch! I've been wanting to use one for a session! I think it is so special that your hubby took these! These are amazing!! He did a great job. I say YES to a trash the dress shoot!! I wanted to do one, but my dad paid for my dress and he wasn't really into it. Haha.